They might've been a family. Nineteen years later, Virginia is engaged, though she has not forgotten Aaron or Buddy. When her dog goes missing and it comes to light that her fiancé set him loose, a distraught Virginia breaks off the engagement and is alone once again. A shy young man has found the missing pet, and although he's bonded with the animal, he answers his conscience and returns the dog. Before long, Virginia and the young man discover a connection from their pasts that will help them let go of painful memories and change their lives forever. Buddy was only a baby when his mother died and four years old when his father died in a horrible accident. His maternal grandparents relocated him to Florida to live with them and start a new life. Virginia had fallen in love and was looking forward to life with Aaron and his son. Their relationship had barely progressed from a light flirtation when it tragically ended with Aaron's death. Catherine Ryan Hyde presents a story that asks what makes any of us worthy of love in her newest book Worthy. Virginia has struggled to build a new life for herself, but she has never forgotten Aaron and his son. Just when it seems as if her life is looking up, her dog disappears and her fiance is the reason why. As Virginia struggles to pick up the pieces of her life after her broken engagement, she must also struggle with the dilemma of what to do with her dog. Jody Schiller is considered a shy and sensitive young man. He leads a relatively reclusive life in a rural cabin with his grandfather. Jody knows he isn't quite "normal," but he deals the best way he knows how. After witnessing a man abandoning a dog in the freezing cold and snow, Jody rescues the dog and finds his first friend. This dog quickly becomes his lifeline in more ways than one when his grandfather dies. But Jody's lifeline may be clipped when the dog's owner comes to get her dog back. 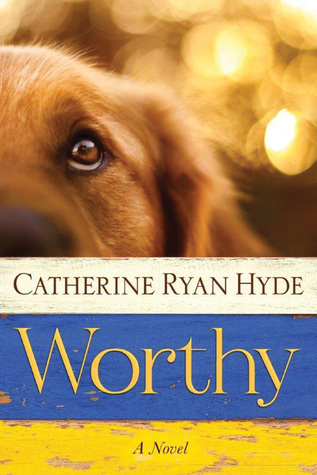 Worthy isn't just a feel-good story about a man, a woman, and a dog. It is a story about self-worth, a search for happiness, and a search for a sense of family and belonging. Jody and Virginia love and are loved by their jointly-owned dog, and it is that love (along with more tragedy and trauma) that bring them together. I found Worthy to be an extremely fast read. I found the characters to be believable and relatable. If you're looking for a feel-good, hopeful-ever-after read, then you'll definitely want to add Worthy to your TBR list. Disclaimer: I received a copy of this book free for review purposes via BookSparks. I was not paid, required or otherwise obligated to write a positive review. The opinions I have expressed are my own. I am disclosing this in accordance with the Federal Trade Commission's 16 CFR, Part 255: "Guides Concerning the Use of Endorsements and Testimonials in Advertising."